She says that by appointing Hunter Biden head of its legal affairs unit, "Burisma is turning to US talent - and money and name recognition - for protection against Russia". The younger Mr Biden isn't the only American with political ties to have recently joined Burisma's board. Devon Archer, a former senior advisor to current Secretary of State John Kerry's 2004 presidential campaign and a college roommate of Mr Kerry's stepson HJ Heinz, signed on in April. Mr Biden and Mr Archer are also managing partners at Rosemont Seneca Partners, a Washington, DC-based investment company. I believe that my assistance in consulting the company on matters of transparency, corporate governance and responsibility, international expansion and other priorities will contribute to the economy and benefit the people of Ukraine. All this could be explained simply as a foreign energy company looking to increase its visibility in the US and spur investment, writes the Federalist's Mollie Hemingway. State-controlled companies currently account for 90% of Ukraine's gas production, but this year Burisma became the nation's largest private producer. The most disturbing explanation is that the company is attempting to curry favour with the US government by enlisting the services of the close family friend and campaign bundler of the secretary of state and the son of the vice president. After all, Archer notes on one of his company's web pages that his firm's "relationship network creates opportunities for our portfolio companies which then compound to greater outcomes for all parties". She concludes that this seems like a "cliched movie plot": "a shady foreign oil company co-opts the vice president's son in order to capture lucrative foreign investment contracts". 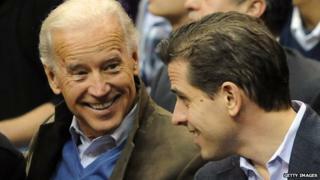 The White House has emphasised that the vice president's son's new job will have no influence on US foreign policy. "Hunter Biden is a private citizen and a lawyer," Kendra Barkoff, a spokeswoman for the vice president, told the Wall Street Journal. "The vice president does not endorse any particular company and has no involvement with this company." China's "brazen aggression" - By towing an oil rig into Vietnam's territorial waters in the East Sea, using water cannons and ramming Vietnamese Coast Guard vessels, writes Nam Thang in the Vietnam News, China has "seriously infringed on Vietnam's sovereignty, running counter to international law and practices and damaging the trust held by the world community". "Why does China keep taking action detrimental to peace and stability in the East Sea?" he asks. "The question needs to be answered because this is not the first time that China has committed acts that further complicate disputes in the area." He calls China's territorial claims on the waters "groundless", and says that Vietnam is a "peace-loving nation", but it "will take all necessary and proper measures to defend its legitimate rights and benefits and safeguard its sovereignty". A faltering democracy - When Guatemala imprisoned former President Efrain Rios Montt for genocide last year, says Haverford College Prof Anita Isaacs, it represented a sign that the country's fragile democracy could be taking hold. Within two weeks, however, Mr Montt's verdict was annulled, she writes in the New York Times, casting doubt in the independence of the country's judicial system. Although the country's indigenous majority tried to push for greater rights and judicial independence, she says, the country's elite turned to blackmail, bribery and human rights violations to reassert their control. "Without a watchful eye from abroad," she says, the elites have ensured that "the unjust structures that serve their needs stay in place, even at the expense of rising unrest, polarization and violence". A just sentence for Ehud Olmert - On Tuesday Judge David Rozen sentenced former Israeli Prime Minister Ehud Olmert to six years in prison for corruption. The Jerusalem Post's editors write that this "sent a message to all public officials that they should strive to be ethically irreproachable". Although it's a "sad day" for the nation, they write, the sentence is "reassuring", as it shows no one is "above the law". This should cause us both shame and pride - shame that such a senior, respected and popular politician could be corrupt; and pride because our law enforcement system did not balk at meting out the appropriate punishment. Accentuate the positive for Scotland - UK Prime Minister David Cameron's strategy of granting more autonomy to Scotland in the hopes that it does not opt for full independence "has proven demonstrably unsuccessful", writes Bloomberg View's Mark Gilbert. Although the pro-union side continues to lead in polls, he says, the gap is shrinking. In order to keep Scotland in the fold, he writes, Mr Cameron "needs to stress what Scotland will gain from remaining in the UK rather than attempting to scare voters by banging on about the alleged downsides of flying solo". Otherwise, he concludes, Mr Cameron could go down in history as the man who lost Scotland. Iran and six world powers start three days of nuclear talks in Vienna on Tuesday. Iranian commentators share their expectations for the latest round of negotiations. "At this juncture, negotiators need strong support from the government and the people in order to calmly conduct the talks... Some comprehend the importance of this new period of modern Iranian history and are seeking to support the negotiating team... But there is a minority in Iran who seeks to realise their personal interests or the interests of their political party, rather than protecting national interests and security." - Seyyed Ali Khorram in E'temad. "Today, the Islamic Republic's nuclear industry is an established industry which is the product of Iranian young scientists' courage, knowledge and experience. In fact, the continuation of this industry is safeguarding the independence and dignity of the Iranian nation. The nuclear negotiating team should be at the frontline of defence for the independence and dignity of the Iranian nation and should never accept Western bullying." - Mohammad Kazem Anbarlu'i in Resalat. "Despite my pessimism about the final outcome, I defend the overall performance of the nuclear negotiating team and believe it is working to defend the rights of Iranian citizens... Merely the notion that members of the negotiating team are revolutionary and committed cannot be a guarantee that they will perform correctly. However, questioning the past and destroying their reputation does not match the idea of duty to the Supreme Leader, and it deserves a divine punishment" - Mohammad Said Ahadian in Khorasan.